We have built our reputation on performance, efficiency, and excellent pricing. Dirty Deeds Junk Removal is built on offering a superior service. Our company has become one of the most sought after junk removal services in Fairfax, Arlington, Alexandria, down to Woodbridge, VA. We come highly recommended by your neighbors throughout Northern VA and DC Metro. We are commercially licensed, insured and bonded. Our trucks are some of the largest in the junk removal business. 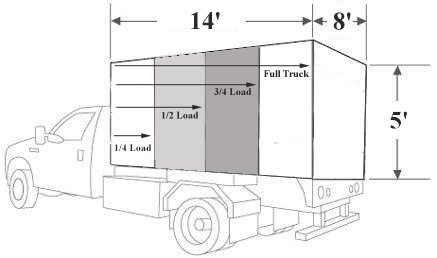 Each truck holds 560 cubic feet of junk (14' L by 8' W with 5' H sides with an open top)...that's 40% more volume than the competition's little blue trucks for less money. You always get more truck for your buck with Dirty Deeds. You can just about fit a lifetime's worth of junk in one of our trucks! Amounts in between are pro-rated so you don't pay for space you're not using and ensure you get more truck for your buck! Pricing includes dumping fees and labor. Two guys will go anywhere on your property, inside or outside, to get the junk you want removed. Simply point it out and away it goes! Refrigerators, sofas, loveseats, recliners, patio furniture, ovens, washers, dryers, grills (we take propane tanks) and more! 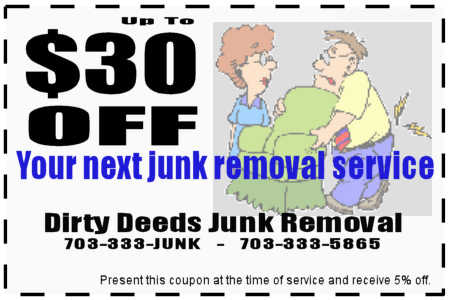 Call (703) 333-JUNK today to schedule a pick-up or use our easy on-line form! Pricing is for household debris and junk. Pricing for large amounts of tile, drywall, concrete, bricks, dirt, lumber and firewood is slightly higher. Call (703) 333-JUNK for more information. Will not damage your driveway or road like a roll-off dumpster. Will not be outside your home as an unsightly eye sore for days and days. Work at your own pace and schedule. *Fencing, firewood, and lots of heavy metal are subject to a surcharge depending on the material.